The radio helps to keep us all connected no matter where in the world we are. From the big cities to the open countryside, radio can reach further than you might expect, and it certainly does bring us all together. Whether you love listening to DJ shows and music, or just want to keep up with the world (or local) news, there is a station for you. However, we can also bring the classic radio into the modern age, and that’s where the concept of internet radio comes in. It’s ideal for areas that have Wi-Fi but no radio signal (and trust me, there are plenty), allowing you to access thousands of stations without needing to worry about fiddling with the antennae. They are great to have around, as well as a good way to stay in touch with all of the latest music, trends, and news. We know it’s not easy to pick a model, or know what’s right for you, but we are here to give you a hand with things. In order to help you find the best internet radio, we have put this guide together, compiling all of the relevant internet radio reviews in one place, so you can find one can keep you up to date. You might be left wondering what internet radio is and how it actually works, which is something we can cover here for you to lend a hand. Sometimes it comes in the form of an app for your smartphone or tablet, and you can use it to stream live radio shows or even catch up on the ones that were previously aired. Otherwise, it is often part of a digital radio and a feature that some of them have so that you have wider access to stations from across the globe – so if you are visiting other countries you don’t need to miss the shows you love. The way it works is really simple as well, all you need to do is connect the radio to your Wi-Fi and stream it from there. It’s such a simple process and one that anyone can complete with ease. Now that you know a little more about how everything works, check out the internet radio reviews below and see what you think. 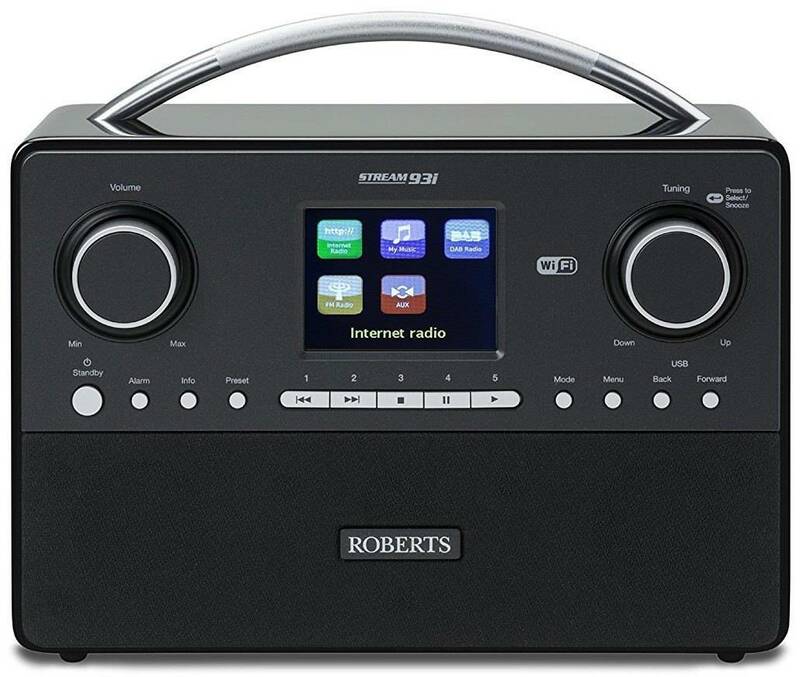 Roberts is a great brand for home electronics and appliances, and with an internet radio from them, you know you are getting something good. As with them all, it has the best stations around for you to access flawlessly whenever you fancy. Just take a look at the reviews below and see for yourself. This internet radio comes in black or white and has a really modern design that will allow it to blend in with your home effortlessly. There is even an option to purchase it with a battery pack for wireless use or a Bluetooth receiver for an additional price. The LCD colour display is large enough for you to use and see everything clearly, ensuring you access the stations that you want quickly. It has DAB, DAB+, and FM wavelengths, as well as the ability to connect to internet stations using a Wi-Fi connection or by being hooked up directly to the router using an Ethernet cable. The internet connection not only means you can access thousands of online stations, but also lets you stream Spotify directly to it, and there are 120 presets so you can save every station that you love with ease. The power cord is a little short, but an extension cord can help to rectify this issue. This nifty little internet radio comes at a good size and a very reasonable price, especially considering all of the additional features that it has. While the power cord is a little shorter than expected, we did mention that an extension cord can resolve this issue, and there aren’t really any other issues with this model aside from that. With brilliant access to both regular and internet stations, as well as a massive number of presets, it has everything you need to enjoy yourself. 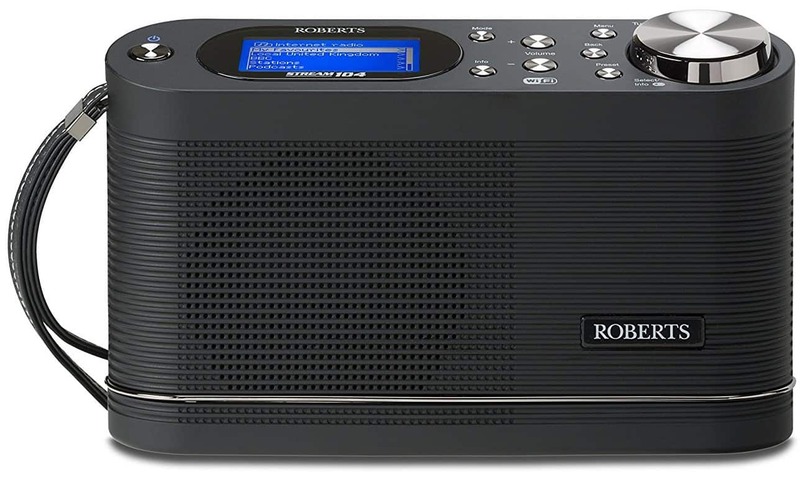 Going straight back to Roberts and their excellent pieces of kit, having a portable internet radio is great for those who like to travel a lot, or work away from home but still, want to stay updated with local news and happenings. Take a moment to read below and see if this is going to be the one for you. 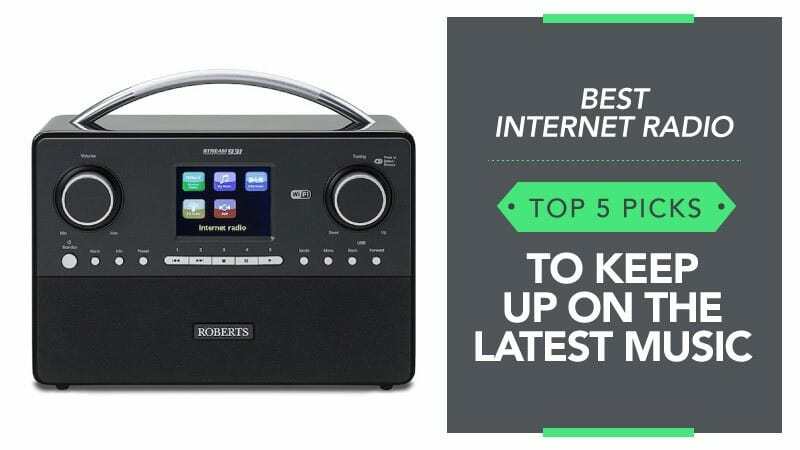 This internet radio comes in black, and features a compact design that really can go everywhere you do - especially since it has a strong loop so that it can be easily attached to things. While it may be smaller than most, the sound quality is excellent, and sure to provide you with a great experience. Plus, it has great battery life and easily replaced batteries when it runs out of charge. Aside from the standard DAB, DAB+, and FM stations, you also have full access to the thousands of channels internet radio provides – so you will never miss out again. It hooks up easily to Wi-Fi, with 30 presets to keep things organised and a headphone jack for private listening, and the sound is fully adjustable. It even doubles up as an alarm to wake you up in the morning and keep you on track. The sound when playing music lacks the depth that other radios have, according to some. This internet radio comes at a higher price than some might expect for a portable device, but it is worth the expense for the sheer quality that you receive. While some feel that the overall sound when playing music lacks depth and bass, it is only a portable model, and the quality is excellent considering – especially for podcasts and radio shows (spoken word). It’s hand and portable, with a range of features and controls that allow for full adjustment of the sound and your overall experience. 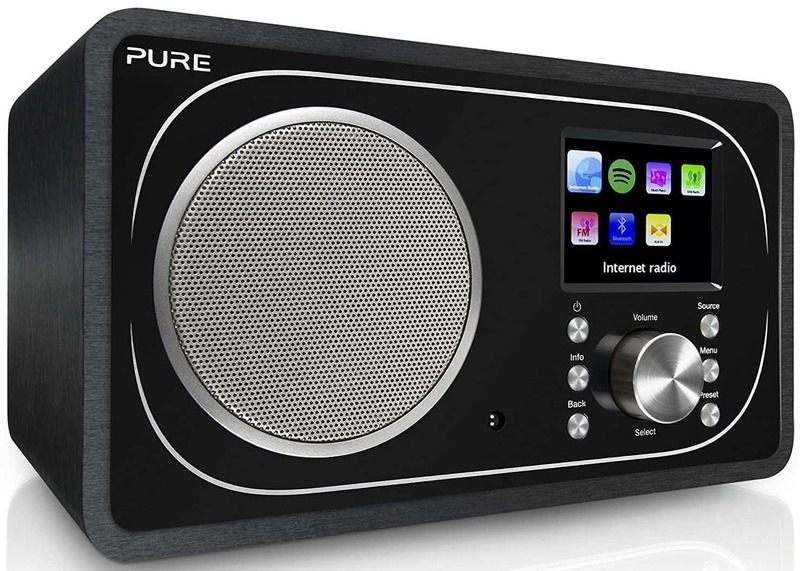 Pure is another great brand, and one that many know for producing radios and audio devices as a whole. Many internet radios also have DAB stations available to give you some variety, and this model is an example of just that. Read the reviews below and see what you make of this model. This internet radio has a design that combines retro and modern to form something that is quite unique – in all the right ways. It also comes in black, allowing it to blend in nicely with the aesthetics of your home. The LCD display is clear colour as well, ensuring that you can see everything with great clarity and are able to correctly access the stations that you want. It even comes with a nifty remote. Aside from having the usual DAB, DAB+, and FM wavelengths, it also has internet radio that can be hooked up using a Wi-Fi connection for full access to thousands of stations across the globe. You can even use it to link up your Spotify account for easy streaming whenever you want. There are also 30 presets included so that you can save all of your favourite stations, and it has been made to be future proof. Some customers found the remote to be a little cheap and flimsy when compared to others. This is a great little internet radio, and it comes at a reasonable price considering both the brand and the additional features. While some have found the remote to be a little flimsy and small, it still works excellently, and there are also controls on the actual radio for you to use. Packed full of features like the 30 presets and the ability to stream Spotify straight to it, this internet radio has everything you need and a little bit more. Here are some further models of internet radio, just in case the ones above do not quite meet your requirements. 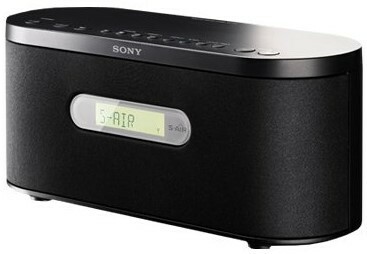 Sony is one of the best and leading brands when it comes to music players and technology, so you are in good hands with this incredibly affordable model. The LCD screen is clear and easy to read, and you also have access to a whole range of radio stations, so you can always tune into the shows you love most. It can be used as both a wired and wireless model, which is great for those who want to take it along to friend’s houses or something similar. There is a sleep timer function included, as well as an alarm, ensuring that you are never late again. All of the controls are easy to access and clearly labelled for your convenience. 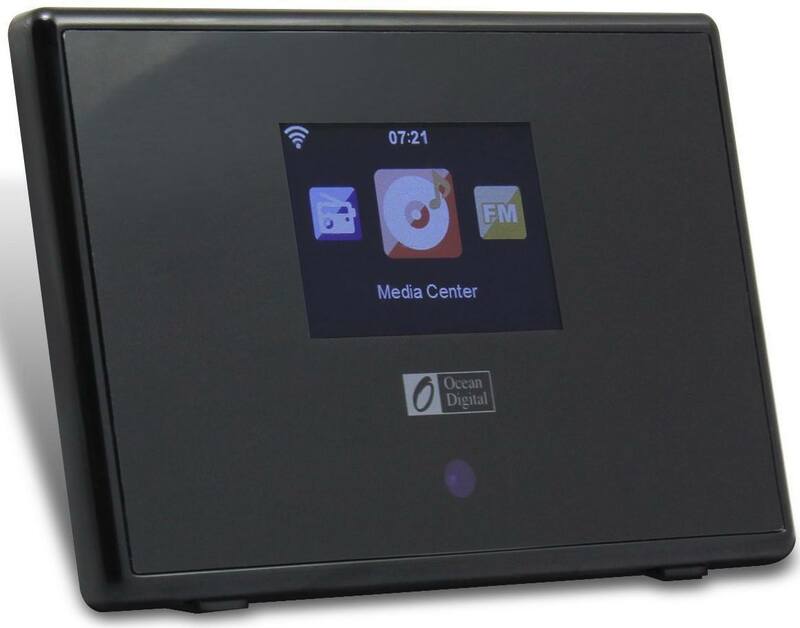 This model of internet radio from Ocean Digital features thousands of internet radio stations that can be accessed using Wi-Fi, as well as 250 presets to make life that little bit easier for you. The Bluetooth receiver also means that you can stream music from other devices, allowing you to have full access to the sounds you love the most. There is also a remote included, which means that you can control it from the comfort of your sofa (or even your bed). The display has everything you need, from the time and what is currently playing, to the weather and your alarm. It will wake you up in the morning, and the snooze button is fairly easy to access when you need it. All of this comes at a very good and reasonable price. Hopefully, this guide has helped you to find the best internet radio, and that it has given you a little assistance when it comes to figuring out which of these is going to provide the best entertainment for you. We have gathered a great selection of radios for you to browse through in the hopes that at least one of these makes the perfect match for you. Of course, with each radio having a different main feature, it is impossible to choose which of these is the best, but we have ensured that they all come from reputable brands so that you get quality and reliability no matter what you choose. We also understand that not everyone has a big budget, and that is why we have collected products that vary in terms of price – so there is something for everyone. What did you think of our internet radio guide? Are there any that you would have liked to see or recommended? We love hearing from you, so make sure to leave us a message in the comments below.